During the last week of 2017 a great load of seaweed sargassum drifted inside the Lagun area. Two years ago Bonaire was surprised with the same natural occurrence. When sargassum is drifting in open oceans it serves as a hiding and feeding space for many fishes, turtles and birds. The problem starts when it enters coastal areas to strand and starts rotting, which causes mortality for many sea creatures. 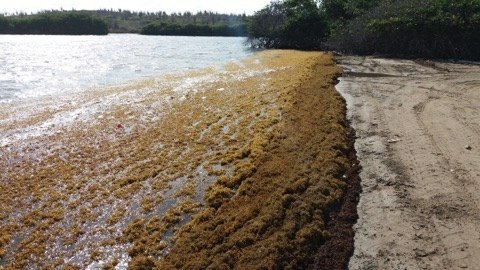 This is why STINAPA made a call to volunteers to help rake out the sargassum out of the water onto the beach to be transported to the landfill by heavy equipment. Together with the volunteers great quantities of sargassum have been removed to prevent more mortality. The removal of sargassum from the water during the past few days has prevented many casualties. 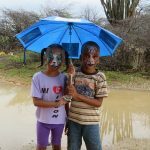 STINAPA keeps monitoring the area closely and in case of emergency will call upon volunteers again to help keep the area healthy for us and the animals we share this space with. With this message STINAPA’s staff wishes you a happy and prosperous 2018.